AMD continues to surge, after significant year-over-year improvements almost everywhere. 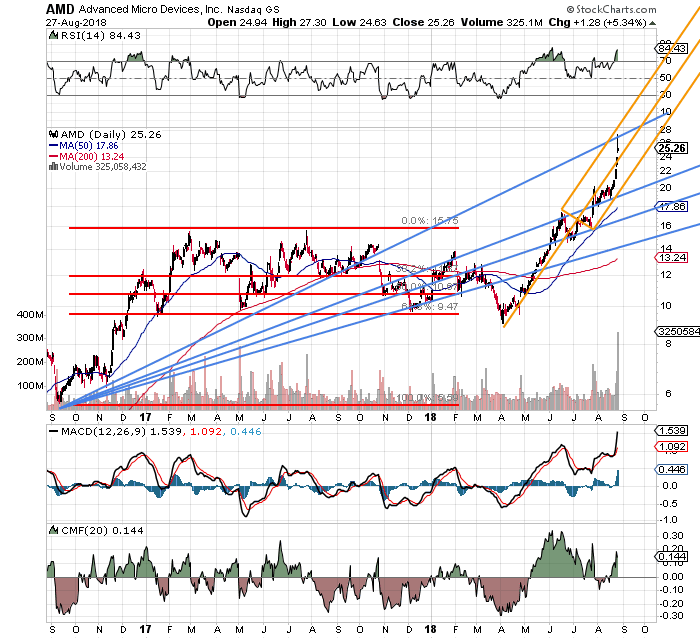 Advanced Micro Devices (AMD - Get Report) is having a crazy run higher. And this elite runner shows no signs of slowing. Like most of kids my generation, I played a lot of sports growing up -- and kept doing so right through my mid-20s. Then it became difficult to find time for oneself, with responsibilities such as raising children and the support required by that family. Hence, like for many of us, that was the end of participation in any team sports that come with any kind of set schedule. About the only thing a young dad or mom can do, sometimes, is run. Not on a time hack. Starting and ending at one's home. The only enemy would be fatigue. All working folks who run, run with fatigue. So, I ran. Many decades later, I still do. Just slower. The equity marketplace has a runner these days, too. A championship caliber runner. Yesterday, Cemex (CX - Get Report) and iQiyi (IQ ran with this big dog for a day. Since mid-August, Action Alerts PLUS holding Nvidia (NVDA - Get Report) has spiked side by side with this elite runner. But this runner has been going hard since early April, only pausing to consolidate gains over June and July. This new champion seems like a beast. The new champ is Advanced Micro Devices, and is led by industry superstar CEO Lisa Su. I can't complain. No, I don't have an equity stake. I have been short put options throughout, though. In fact, I am short put options right now. That provides revenue, but not what the equity provides for shareholders when a name goes semi-parabolic like this. Let's take a look. Over the weekend, AMD introduced the firm's high-end Radeon Pro V340 graphics card at the VMware (VMW - Get Report) conference in Las Vegas. That, at least, is the most recent news. AMD popped on Monday, closing at $25.26, an increase of 5.3% after trading as high as $27.30 mid-session. Monday's closing bell closed the book on the stock's seventh consecutive day of gains. It's not just this news however. This name is 57% higher since putting better than expected second-quarter data to the tape on July 25. Here is what Su just told TheStreet. For the year, AMD is up... wait for it ... 146%. And that is after being down for the year when that early-April turn was made. All the while, Lisa Su was slowly setting the firm up to take market share away from Nvidia in graphics, and another of my names, Intel (INTC - Get Report) when it comes to CPUs for personal computers and processors. Simply put, as a long-term Intel guy, I want Intel to hire Lisa Su. Short of that happening, I want in. As you all know by now, I don't chase. Let's look at short interest. As of two weeks ago, more than 20% of the firm's entire float was still held in short positions, totaling more than 146 million shares. Guaranteed that number is down from there, as yesterday's top sure looked like a squeeze to this old dog. By the way, according to MarketWatch, AMD is the third least profitable (or worst performing) aggregate short position of 2018 in terms of dollars lost, only behind FANG names Amazon (AMZN - Get Report) , and Netflix (NFLX - Get Report) at this point. Amazon is an Action Alerts PLUS holding. Let's go back to those Q2 numbers reported on July 25. That quarter, in addition to beating expectations for both the top and bottom lines, showed significant year-over-year improvement almost everywhere. Net sales, EBITDA, cash on hand, profit margins, return on assets, interest coverage.. all up big. Know what was down? Total debt, and debt-to-capital ratio. Big swing and a miss there, Sarge. I could have had a V8. Okay, this horse runs with a beta of 1.6. That means that technically, we are going to get a selloff. I keep telling myself that. Three-year sales growth is hot at a rate of 14%. Current and quick ratios are fine. Cash flow is solid. Third-quarter earnings are due October 22. Let's go to the chart. See the Pitchfork? No way that trajectory holds, or at least I'm not buying the name at the top of a model like that. Daily MACD? reminds me of Crazy Eddie. The Fibonacci Fan as laid out gives us something, at least that is if the remaining shorts have enough gas in the tank elsewhere to not end up being forced into action. With a naked equity position out of the question at these levels, at least for me, I've got to figure something else out. Note: I have been shorting AMD puts all along, without ending up having to buy the shares. It is important that the investor not only be willing to buy the shares, but actually want to own the shares on a dip, which is the fact in my case. If I end up never eating these shares, at least I drag in some revenue with the stock's upward movement. Better than being a wallflower at the school dance. Now, mind you, when it comes to AMD, I have been more like the Mighty Casey than Mike Schmidt. If one felt compelled to own the shares, my thought would be to alleviate the cost by writing a covered call against the position. Free White Paper: 7 Things All Investors Must Know in 2018. Start the second half off right with our free white paper on seven key things to watch this year. From how much cash to have on hand to the three reasons this bull market might die, our white paper features key takeaways from an all-star panel that TheStreet and Fisher Investments recently hosted in New York. Click here to register for your free online copy. At the time of publication, Guilfoyle was long AMZN, INTC, NVDA equity, Short AMD, INTC, NVDA put options. Companies in the S&P 500 bought back a record $806 billion of their own shares last year. But the tactic - used by CEOs to juice their stock prices - may become less common as more companies confront the need to pay down debt, Bank of America analysts warn in a new note. What Is Berkshire Hathaway and What Does It Do in 2019? Berkshire Hathaway is a holding company led by Warren Buffett that owns dozens of subsidiaries in the tech, insurance, and food industries (among many others), and whose stock is the most expensive stock you can own. Until the production and exploration companies start gaining momentum it will be hard for service companies to do the same. The combination of growing dividends along with simultaneous share buybacks can be powerful.